If there’s one thing we all know about the football gods as Patriots fans is that they never make it easy on us. Our largest margin of victory in a Super Bowl is six but for us to win that Super Bowl, the Pats only had to overcome a 25 point deficit with 17+ minutes remaining. Look out for a couple of things. Low scoring in the first quarter as both defenses will start strong, but at the end of the game the scoring will pick up as always and it will turn out to be a Goff vs. Brady shootout. Here’s some keys of the game for the Patriots. The Patriots got one week to prepare for one of the best offenses in NFL history and shut them out in the first half which is ultimately why they won the game. I’m sure the players and coaches will come up with a solid plan to stop the Rams high flying offense. For defense, the Patriots need to contain Gurley whether that is on the ground or catching passes out of the backfield even though he has been struggling lately he is still a major threat. Expect Kyle Van Noy and maybe even Elandon Roberts to have the task of containing the pro bowl back. The next biggest threat on the Rams offense is a familiar face in Brandin Cooks. He’s fast, he’s agile and he’s lethal. Cooks has the ability to burn corners over the top and make a catch in stride underneath and get extra yards with his speed. Expect the Pats to treat as a Tyreek Hill type player and expect Stephon Gilmore to be covering him with Devin McCourty over the top spying. Finally for the defense, with all the weapons that the Rams have, you can’t forget the two tight ends Tyler Higbee and Gerald Everett who can do it all. They can block the run, protect the pass and catch passes. Everett has some speed on him so it could be a tough task for Duron Harmon or even Patrick Chung. If New England contains Gurley, Cooks and the tight ends as well as constantly applying pressure on the young QB Jared Goff and make him make mistakes, then all it would be up to number 12 for New England. For the Patriots offense the biggest concern is number 99 on the other end of the field. All- Pro, NFL sack leader and the record holder for most sacks in a season by a defensive tackle, Aaron Donald will be the X-Factor for both sides. The Patriots O-Line has not let up a sack all postseason and if they manage to keep that streak it will be one of the most impressive stretches off all time by an offensive line. Donald will line up against Center David Andrews and maybe even have Joe Thuney or Shaq Mason double him. That leaves Ndamukong Suh and Michael Brockers as well as Dante Fowler lined up against Shaq Mason and Trent Brown. As for the skills players, Tom Brady has much better weapons as compared to Super Bowl 52 where he passed for 505 yards with only three receivers. This year he will have his favorite target back in Julian Edelman. If the Rams come out Sunday and play zone on Tom Brady than Brady will have a field day, but they won’t. The Rams will press at the line like they usually do and contain the middle of the field to force Brady to throw outside and not dinky 3 yard passes that turn to 15 yards underneath. Get James White going please! If he gets going early expect around 12ish catches for about 70-80 yards and maybe a TD but A LOT of first downs. Lastly, the run game for the Pats will be key if they want to rack up Lombardi number 6 on Sunday. 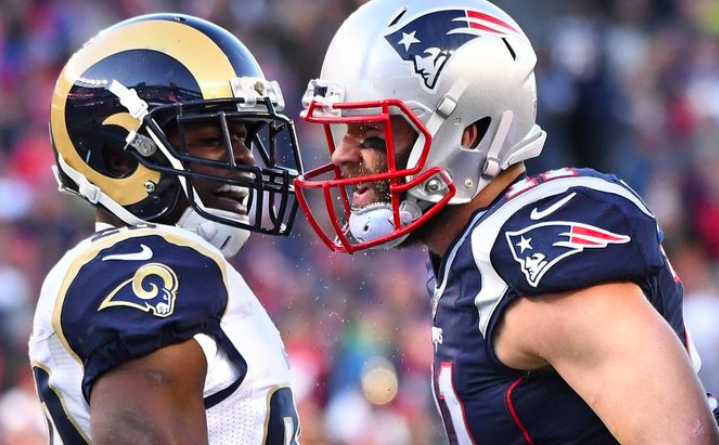 Even though Bill Belichick tends to go with whoever is having the best game in the past Super Bowls, get a combination of Rex Burkhead and Sony Michel going and make it hard for the Rams to stop them. Nobody knows what to expect for Super Bowl LIII but if there’s two things for sure, expect a game that will be remembered for years to come and for Tom Brady to be lifting his 6th lombardi trophy at around 11:30 Sunday night. No question that this game will be high scoring. You might think that the LA defensive line with Aaron Donald, Ndamukong Suh, and Samson Ebukam will be too much for the NE offensive line, but they’ve been infallible this postseason and Tom Brady has not been sacked even once. One the other side, while the New England defense stepped up against the Kansas City Chiefs and destroyed the Los Angeles Chargers, the Rams are different, more powerful team with lots of weapons. Jared Goff has really been slinging it all year, passing for 4,688 yards and 32 touchdowns, completing 64.9% of his passes. In the postseason, he’s connected for 483 yards and one touchdown, completing 58.8% of his passes. With weapons like C.J. Anderson ready to play if Todd Gurley’s having trouble and the constant positives in Brandin Cooks and Tyler Higbee, Goff has a lot of options that will surely translate into lots of points, despite the prowess the Pats’ defense has showed these playoffs. Why do the Pats pull away? It’s Thomas Edward Patrick Brady standing in the pocket with Bill Belichick calling the plays. This isn’t a sophomore Patrick Mahomes with Andy Reed, this isn’t a broken Ben Roethlisberger with Mike Tomlin, and this certainly isn’t a robbed Drew Brees with Sean Payton. This is a winning quarterback who has only lost the Super Bowl to Eli Manning on miracle catches (as well as a Wes Welker dropped pass) and Nick Foles in a feat of pure miraculousness. Goff will be back in the Super Bowl one day, probably against Mahomes, but as for winning this game, when push comes to shove, the better quarterback and the better coach prevails. Just for some proof of Brady’s superiority in pocket, while passing for slightly fewer yards and touchdowns (4,355 yards and 29 TDs), the G.O.A.T. hit 65.8% of his targets and threw fewer interceptions in the regular season (11 interceptions for Brady, 12 for Goff). In the postseason, while Brady has passed for only 274 yards, he’s hit targets in the endzone for two TDs, and he’s completed an astounding 70.5% of his passes. Lastly, Sony Michel is the main reason Brady’s passing yard numbers are so low. He’s rushed for 242 yards and five TDs over New England’s two playoff games. The score’s gonna be high, but the Pats are really gonna tear it up and pull away with Super Bowl victory number 6.